Like many knitters who take up knitting for NICUs or other charities, my first patterns came from the incredibly generous, talented, and inspiring Bev Qualheim of Bev's Country Cottage. 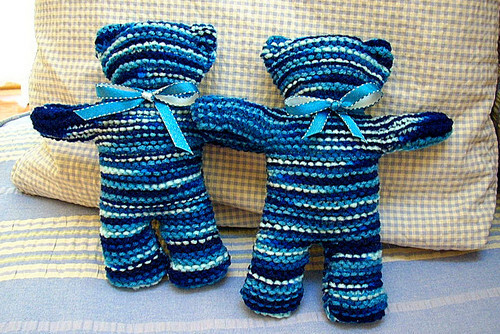 My first teddy bears came from a pattern on her site: Bear Pair Teddy Bear. This pattern was donated by its designer for charity use only. Great for NICU's, police children's programs, Pediatric units, homeless shelters, and other wonderful charities. It's a quick work up and easily adapted in size by changing yarn ply and/or needle size. It can also be dressed up or down depending on the look desired or the age of the babies/children for whom it's being knitted. Do check with your charity of choice prior to making them up so that you can fit your efforts to their needs. For example, as a novice, I made several bears up for our NICU and then found out that due to infection issues we are not allowed to keep any toys in their cribs/isolettes. But. The bears I made were given to siblings of our NICU babies. It was still a win-win. I just needed to make my efforts better coordinate with our NICU's needs and policies. Just a hint I've learned personally: don't forget the children and teenagers of your family! Last year I made these with size 8 needles and chunky yarn for each of the teenaged girls in my family, each in their favorite colors, and I think it was one of their favorite gifts. Since they don't chew buttons off like a toddler, I added googly eyes to their bears, as well as heart buttons on the left chest to remind them that Aunt Gonnie loves them. The bears were a huge hit. I think that's proof that you're never too old to enjoy a cuddly teddy bear. I selected this post to be featured on Knitting Blogs. Please visit the site and vote for my blog! To think it all started in the summer of '08 with two matching teddy bears for two matching twin brothers who stole my heart for the three months I trained in the NICU, learning all the phases from micro-preemie through Big Boys from them--You will always been in heart, my little Little Boys! Over 600,000 premature babies are born every year in this country alone, finding themselves with their anxious parents “living” in NICUs (Neonatal Intensive Care Units) across the country. Premature babies need careful monitoring of their development to insure safe passage past their due dates: namely the transition of their lung development, learning to feed, and regulating their own body temperature. Even inside warming beds many babies still lose too much of their own body heat in those crucial first weeks, so a covered head is often standard operating procedure in the NICU. I am a respiratory therapist in Springfield, Missouri who works in adults, NICU, and pediatrics. For going on four years now I have been creating patterns for the little Littles in our NICU and am one of a group of knitters who stock our NICU with hats, booties, and cuddling blankets. My personal area of expertise is in creating holiday and other themed hats that we send home with our babies as souvenirs of their time with us. Knitting “Wow!” hats became a mission for me the day a 25-week/ 24 oz baby’s mother said to me “I love that your hats make me feel like my baby is a real! I walked in to see the bunny ears on her head on Easter morning and smiled. For the first time since she was born I felt hope she would come home.” As clichéd as it sounds, a smile may seem like a small thing to you and me but for those moms and dads literally facing their worst nightmare, I am humbled and grateful to be a part of a project that can bring a smile to someone who lives in fear of losing that child. While term newborn baby hats are widely available both commercially and in needlework pattern books, the same is not true for premature babies. The lack of existing books is the reason I first began creating my own designs which, to my pleasure, became so popular with the parents and our staff that I'm often asked if I have patterns available for term babies (and toddlers and teenagers and adults...). Grin. I'm thrilled to announce that coming up this September (2011), Leisure Arts Inc is publishing a craft booklet containing 18 of my designs sized for micro-preemie through 12 months, titled "Seasonal Hats for Babies". In the upcoming weeks until the book comes out and the plethora of fall/winter holidays begin I will be posting pics of hats gone by, so to speak, the hats that I and my little gang of nifty knitters have been pouring out for the past three years. For all of those RN's, RT's, and NICU Moms and Meemaws who knit for NICU's everywhere, I'd be honored if you share this journey with us along with your input and stories of your own NICU "little Littles." I don't promise to upload all of our patterns since we each have our own gifts and there are published patterns in the works, but I do intend to sprinkle this blog with some of my patterns plus links to other fabulous knitters, patterns, and cool informative sites.